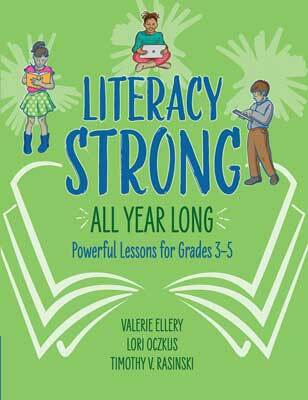 Literacy Strong All Year Long: Powerful Lessons for Grades 3–5 equips intermediate educators with engaging lessons that motivate students and help them develop the solid foundation of literacy skills that are essential to learning. Thoughtfully designed lessons linked to specific literacy standards create a seamless flow of learning throughout the seasons of the school year. Each chapter offers 10 lessons that strengthen comprehension, fluency, word work, and vocabulary. Starting the school year literacy strong. Lessons demonstrate routines, expectations, assessments, and opportunities for students to collaborate in a rich literacy community. Beating the midyear blahs. Lessons offer ways to maintain momentum, monitor expectations, and chart individual progress. They include strategies to strengthen relationships among students, teachers, and parents. Ending the year with intention. Lessons outline strategies for helping students achieve literacy goals and provide ideas for boosting endurance and growth. Stopping the summer slide. Lessons reinforce literacy strategies, invite students to read over the summer, and remind students of continued goal setting. The 40 interactive lessons are presented in an accessible and comprehensive format that includes sections on preparation, active engagement, and reflection. The lesson design intentionally guides teachers to gradually release responsibility to students as they grow into self-regulated, literacy-strong learners—able and eager to use their skills to expand their learning horizons. This book is a co-publication of ASCD and ILA. Valerie Ellery has dedicated 30 years to the field of education in various roles as a National Board Certified Teacher, curriculum specialist, mentor, reading coach, international educational consultant, and best-selling author. Timothy V. Rasinski is a professor of literacy education at Kent State University. He has written more than 200 articles and has authored, coauthored, or edited more than 50 books or curriculum programs on reading education. His scholarly interests include reading fluency and word study and readers who struggle.